So you want to be a Tower Climber? Our world is changing so fast. New technology brings so many new fields for interested people who want to experience different jobs. One of the hardest and most unusual jobs in the world is tower climbing. With the increasing use of wireless electronic devices, the need for tower climbers is increasing every day. The job has been recognized in 2004 as one of the most dangerous jobs in the world. Tower dogs can work in several places. They can work on television and government radio towers, commercial radio, and navigation towers. Many of these highly skilled and highly trained people install and maintain antennae, and other transmission systems. 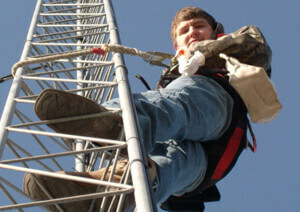 A tower dawg must carry all necessary equipment and testing devices up the tower as he or she climbs, and then they have to search accurately for the damaged section, and repair it. But if more serious problems are discovered, other tower dawg colleagues will be required to aid in the repair. A person who wants to be a tower dawg should at least have a school diploma with high grades, great physical strength, and definitely cannot be afraid of heights! These are the very basic necessities for a tower dawg. Having primary knowledge about electronics is the next step. You must know how to repair an antenna wire and cables. It is necessary to pass some classes, and get some qualifications in this area. Companies that want to employ tower dawgs will usually hold some classes for those that are interested. In these classes, which may take a single day, but can stretch over a week, will teach you climbing techniques, safety procedures, and other principal techniques of the trade. Training courses will often include two levels. First, it is vital that you learn OSHA rules, standards, and how to operate the necessary equipment. In the advanced level, you will learn current tower safety training standards that are used by OSHA, NATE, American Tower, Bechtel, General Dynamics, and many others. Advanced training will also include rope access skills, self-rescue, advanced rescue techniques, and rescue planning. Some electronic courses will need to be passed. Although a tower climber must pass all necessary courses, and know all of the rules and standards in the job, they must still be careful with every tower that they climb. They must especially consider a suitable climb plan with each tower, never climb with unsafe gear, and must turn on the RF personal alarm during the climbing time.